As they near the end of their mission to release ten new red beers to mark a decade of brewing on the Mornington Peninsula, Red Hill has concocted the biggest of the lineup to date. The brewers claim it's a pimped up version of their Scotch Ale, but it's a long way removed at nearly twice the ABV, as if Xzibit had recorded an episode of Pimp My Beer while hopped up on goofballs. As such, the label artwork features the lady of the title not losing her own head but instead taking a large blade to a barrel of red stuff. As for the brew that now bears her name, it's a deep mahogany drop with ruby roots (a flaky Hardfloor reference for any ageing acid techno heads out there), so it's not overtly red; indeed, when last we crossed paths, Red HIll's Dave Golding joked that the project was one in which the beers weren't delivering much in the way of redness. 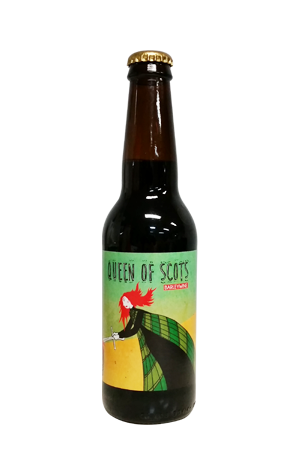 What the Queen of Scots does deliver, however, is plenty in terms of barley wine-ness: raisins, boozy plums and toffee abound, while there's a finish akin to an aged Muscat or Sherry that warms you steadily as the 10 percent ABV booze makes you steadily unsteadier.